When devastating earthquakes hit Haiti, Japan and Nepal, American search-and-rescue teams were there with their specially trained dogs to find victims. They were also among the first to arrive on the scene when Hurricanes Katrina and Sandy ravaged parts of the U.S.
Ron Sanders and his six-year old Labarador, Pryse, were part of a U.S. team that was immediately deployed to Nepal to help find survivors. Sanders, a retired firefighter, is now with the Fairfax County Urban Search and Rescue Team in Virginia. He said Pryse and the other special canines are an essential part of search-and-rescue teams for several reasons. 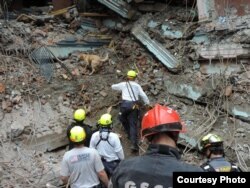 The dogs can also navigate quickly through collapsed buildings and squeeze through tight spots to find victims. For the dogs, rescue missions, both real and practice, are a fun and playful adventure. “They want to go find that person, to play with that person," Sanders said. But becoming a rescue dog is serious business. To become certified, the dogs have to go through rigorous training that can last from six to 12 months. What helps them get there is lots of practice. They do most of that at a large training field in Lorton, Virginia, a former prison complex that’s made to look like a disaster site. Here, the dogs learn to follow hand signals and voice commands while running on narrow planks of wood, going up and down ladders, and navigating rough terrain in the search for survivors. Finding one, which they almost always do, is the ultimate reward. 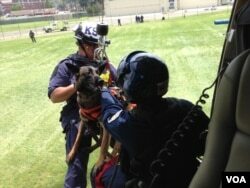 The dogs also train on helicopters that are made available through the U.S. Park Police Aviation Section. The reason, Sanders said, is that while on a mission, sometimes the roads will be impassable, "Helicopters might be the only way to get there." The dogs are taught to get in and out of a helicopter while it's on the ground and running, so they can become acclimated to the noise, the vibrations and the downdraft. Then they are picked up from the ground in a special harness while being held by their handler as they're both hoisted up into the helicopter and lowered back down. “It teaches them to trust us and to know that it will be all right,” Sanders said. At the end of the day, it's all about trust, Sanders said — trust between the trainers and their dogs, who will be there when disaster strikes, trained and ready during those crucial moments that can make the difference between life and death.